Taming the great outdoors. At last, a one hand operated electric vehicle that you can drive around your yard, garden, neighborhood or village effortlessly. Steer it around behind the house, cut across the back yard, over the dirt path, clamber up the grassy knoll and head for the center of town or your favorite fishing place. 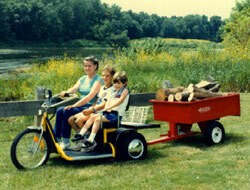 Easy operation of the vehicle makes a pleasure trip out of all your outdoor chores and errands. You'll drive places you only wished you could go before. Note: The Yardcart can qualify for insurance purposes as a mobility aid, an electric wheelchair, scooter or Power Operated Vehicle (POV) for the disabled. Accesories available. Single seat $5920.00 plus shipping. Double seat $6240.00 plus shipping.